TikTok, known as the international version of the Chinese successful short video app Douyin, is a global hit. Despite Bytedance’s efforts to present Douyin and TikTok as being the same product, they are actually two separate entities. Douyin, (抖音, literally “shaking sound” in Chinese) is a short video media app owned by China’s young tech giant Bytedance (字节跳动). The app allows users to create, edit, and share short videos as well as livestreams, often featuring music in the background. Douyin’s international name is TikTok, an app that looks the same as Douyin, while in fact, the two are not one and the same, despite Bytedance’s efforts to brand it as such. This is not the first time a Chinese tech company presents one app as being the same everywhere, while it actually is not. Tencent’s super app Weixin (微信), also known as WeChat, runs two different systems for its Chinese and international version, as explained here. When downloading either WeChat or Weixin, both being the same app, the app determines what features you can use and what information you can see based on the telephone number you register your account with. In practice, this means that when you are a non-Chinese resident, you will be using the ‘international version,’ meaning you will have access to (international-specific) content that a user registered with a Chinese telephone number will not be able to see. The overseas version also does not have the same Wallet functions the Chinese version has. The difference between WeChat vs Weixin and TikTok vs Douyin, however, is not the same. Whereas the first is basically one app with two different modes, Douyin and TikTok are two completely separate entities. Depending on the app store you use, you will either be able to download Douyin or TikTok. Users of Chinese app stores can only find Douyin, whereas users of the overseas Apple store or Google Play will only find TikTok available for download. That the apps are actually separate systems becomes clear when running the same search words in both apps. As shown below, both apps provide different content for the same search words. Left image: TikTok, Right image: Douyin. For example, one of TikTok’s most popular channels of this moment is called ‘LisaandLena,’ a verified account by two German twins which has over 32 million fans. 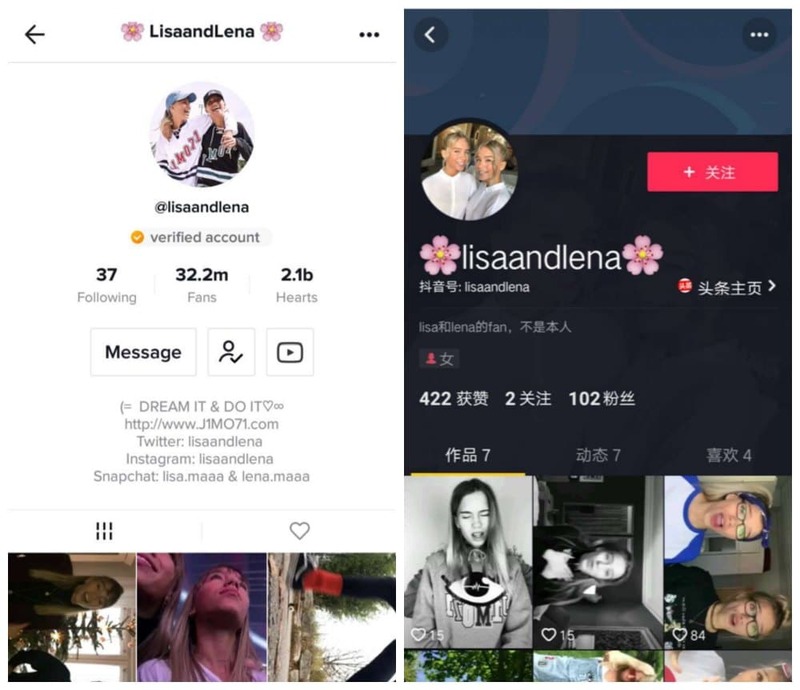 However, when you enter ‘LisaandLena’ in Douyin, the only result is an unverfied account which only has 102 fans and shows seven videos. Results are the same the other way around. One of Douyin’s most popular accounts is that of Chinese actor Chen He (陈赫), who has over 52 million fans features 62 videos at this week. 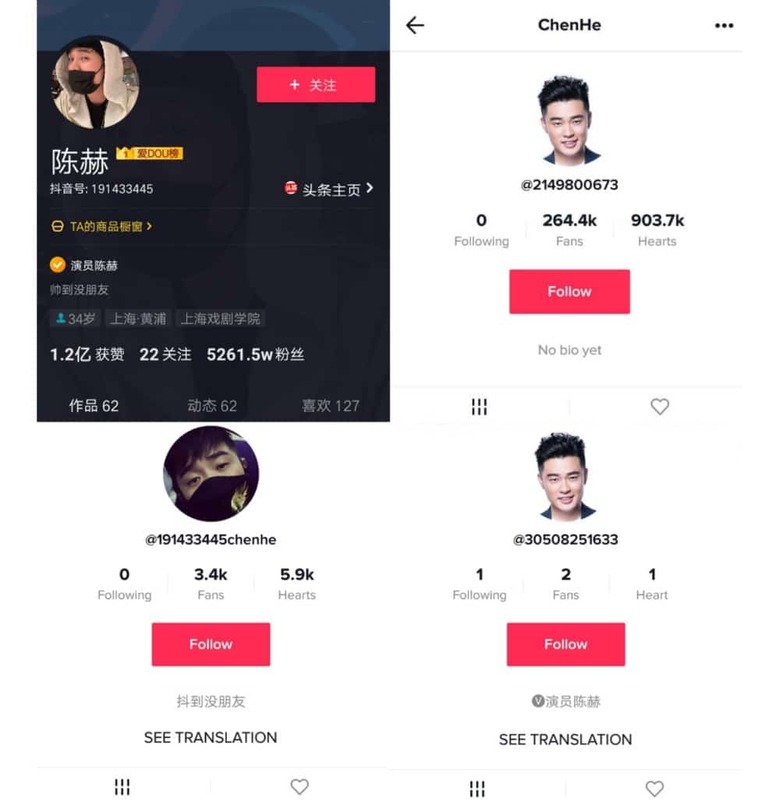 However, when running the same name search in TikTok, several unverified accounts come up, all showing some similar videos like those on Chen He’s Douyin account. Top left picture: Douyin; top right and two bottom pictures: TikTok. This suggests that, although Tiktok and Douyin have the same functions, layout, and logos, its users in China and overseas are kept completely separate and are not able to interact with eachother, something that a recent Chinese blog also discusses in detail. Ever since its launch in September 2016, Douyin has grown immensely popular. Just one year after its release, Douyin had more than 100 million users and became the second most downloaded app in the Chinese Apple store. In September 2017, ByteDance took its app overseas; branding Douyin as TikTok for the international market, while keeping the app’s original name, Douyin, for its Chinese market. Similar to Douyin, TikTok appeared to strike the right chord among internet users right away. In the first quarter of 2018 (note: within half a year after release), TikTok was the 6th most downloaded non-game app in the Apple app store and Google play store combined. In the Apple app store, it was even the most downloaded app. With its 45,8 downloads in the first quarter, TikTok beat apps such as Facebook, Youtube, or Instagram in the popularity rankings. But that is not where TikTok’s short-video craze halted. In August 2018, TikTok merged with short video app Musical.ly (founded in 2014), that had over 100 million monthly active users at the time. In October last year, after receiving several investments, ByteDance Ltd. officially became the worlds most valuable private start-up, valued at 75 billion dollars. By summer, ByteDance announced that TikTok, (meaning both apps combined) had more than 500 million monthly active users worldwide. About 300 million of these 500 million monthly active users are China’s domestic users. Why does ByteDance separate Douyin and TikTok? Why would Bytedance go through the effort to create two apps running on different systems? The answer partly lies in China’s strictly controlled online environment, where (social) media companies have to adhere to local policies on what is and what is not allowed to be published on their (user-generated) platforms. In 2018, Bytedance was already criticized by authorities for hosting ‘inappropriate content’ on its news platform Jinri Toutiao. The joke app Neihan Duanzi, also run by Bytedance, was forced to shut down. Afterward, the company vowed to hire 4,000 additional censors, clearly not taking any risks in getting more warnings from authorities. By separating Tiktok from Douyin, ByteDance can closely regulate the contents uploaded to Douyin, as they will be disseminated within China, while leaving overseas TikTok and its users relatively free to share whatever content they want to share (do note that the app also set up a team of 20 censors in Indonesia to monitor and ‘sanitize’ content from the platform there, after receiving complaints from Indonesian authorities). In light of tighter control on online video platforms, it seems that Bytedance’s monitoring team will have to work around the clock. On January 9, China’s Netcasting Services Association (中国网络视听节目服务协会), an association directly managed by the Ministry of Civil Affairs, issued new regulations that online short video platforms in China should adhere to. One of the new guidelines requires all online video service providers to carefully examine content before it is published. Tech Sina reports that the new stipulations require that all online video content, from titles to comments and even the use of emoticons, has to be in accordance with regulations, which prohibit any content that is ‘vulgar,’ is offending to the Chinese political system, puts revolutionary leaders in a negative light, or undermines social stability in any way. On Weibo, the newest regulations became a topic of discussion, with many netizens wondering how short video apps such as Douyin are going to comply, and how its users will be affected. Although Douyin has not responded to how and if its platform will change in light of the latest regulations, we can expect that TikTok will not be affected – it will be marching to the beat of his own app. Interested to know more about Bytedance and TikTok? We recommend listening to this podcast by Techbuzz China.